Faucets are increasingly becoming an important feature in bathroom as well as kitchen décor. They give a bold statement about the taste of the owner of the house and give your home a unique and stylish look. Today, rustic faucets made of copper, nickel and oil rubbed metals are available in all designs and finishes one can think of. 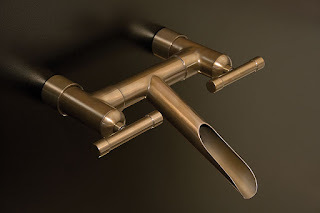 From waterfall vessel faucets to oil rubbed bronze deck mount and floor mount faucets, customers can choose from a large variety according to their tastes and the overall décor of their homes. Wall mount faucets in rustic nickel are now the most popular finish in faucets. For faucets, the general trend is to customize. If you are looking for an Old World or Tuscan Style for the interior of your home, choosing an oil rubbed finish might work well for you. Rustic faucets with a burnt and brownish tone will give the look and feel of a cottage setting. To give a more elegant and sophisticated look to your home, nickel might be a more appropriate choice. Moreover, faucets are something that one sees and touches several times in a day. If watching it or using it doesn’t make you feel good, your faucet is then merely serving the purpose of simply any ordinary faucet. Rustic faucets and farmhouse style bathrooms are quickly becoming the new ‘in’ thing. What once used to be merely for cleaning dishes in kitchens and washing hands in bathrooms has now evolved into a form of expression. They are like jewelry for your kitchen and bathroom, and without the right kind of faucets, the look can never be complete. Homeowners doing renovation or remodeling of their homes look for a rustic faucet that will blend well with the rest of the home décor. What a homeowner will never want is for his guests to point out one single thing that does not go with the overall look of your bathroom or kitchen. Hence, besides how your rustic faucet looks and feels, it is also important that it offers uniformity with everything else in your home. For example, if your kitchen has a copper backsplash, a rustic faucet is likely to complement it. On the other hand, a homeowner can go for a unique technique by using elements that are somewhat disconnected to each other, as long as one can deliver an eye catching design.